I am 100% addicted to this series! I love Raven and Christian. I kind of unexpectedly starting reading the series...and now I can't put it down. I am so glad this book is out this month, I have been waiting on pins and needles! Thanks for making such an engaging series and keeping this story alive, I have fallen in love with Raven as my heroine and can't wait to see what happens! I cannot wait until the 20th of March! 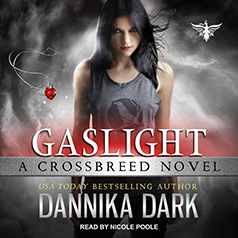 I've absolutely love the crossbreed series. These books are so good they should be put on film.